Hanso Burner belongs to the first-class of CD/DVD burning software that work with Windows. 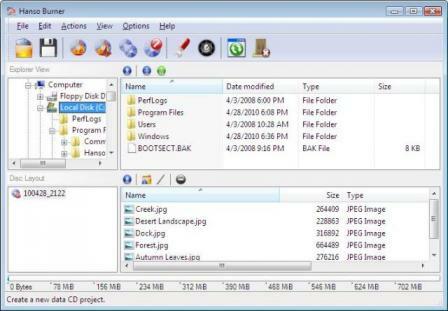 The program is a most comprehensive solution for doing backups and creating/reading ISO files. Hanso Burner is all about simplicity and convenience - no overcrowded tabs, windows and icons or futile features to get you confused. Hanso Burner gets the job done with high speed and accuracy requiring to special skill from the user; it's based on a very powerful engine and modern burning technology, full features for backup solutions, user-friendly interface and the classic but well known GUI. At launching Hanso Burner you will presented in the main window with six clearly labeled icons: Data Disc (CD/DVD), Audio Disc, Video Disc, Write Image, Copy Disc, Read Disc and a top toolbar which, however, can be customized. Click on the View button at the top of the window, select Toolbars and then Customize. Further configuration of the program (for which there's a special icon in the top-right) includes General (features), Advanced (features), Language (features), Shell Extensions (features). Hanso Burner is released under GPL version 3. It`s very easy to use, and what`s more important, gets the job done very fast! I can burn a CD in just a few minutes! This is the most reliable burning software you can get. Has all the features required for quality CD burning. Definitely is one of the best choices!